If you bought an unlocked iPhone 4 and planned on using your iPad’s MicroSIM with its unlimited data plan to provide your handset with the service it deserves, your actions will be met with a firm “No.” from Apple. Leigh, over at GadgetGuy, pointed us to Apple’s iPhone 3GS and iPhone 4 FAQ page where customers can find out what they will need to be able to use their new iPhone 4 devices. One of the questions: “Are iPhone 4 and iPad micro-SIM cards interchangeable?” spells it out in black and white, your iPad MicroSIM will not work with your iPhone 4. The move doesn’t come as too much of a surprise, especially as Apple has already ruled out iPhone/iPad tethering. I wouldn’t be surprised if Apple, in negotiations with the carriers, have been specifically told not to allow the porting of MicroSIM’s so the networks can enforce their strict data transfer policies. That isn’t to say that some enterprising Apple hacker can’t enable something within either Apple device to unlock the functionality, I assume the block would be on the device, not the MicroSIM itself (although I am happy to be wrong). Sorry Apple, my money is on the hackers. Update: We have had some great comments on Twitter alerting us that iPad MicroSIM’s do not have call functionality. Taking this into consideration, Apple will not have “blocked” the interchanging of SIM’s. 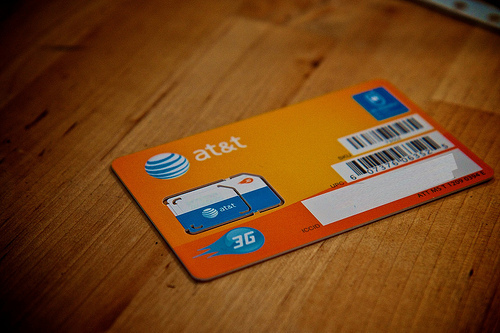 The card will not work in your iPhone 4 because it simply cannot make calls unless your network carrier is specifically amends your service to make your MicroSIM a dedicated iPhone 4 SIM. This would of course mean you would be tied into a new contract and tariff, negating the unlimited plan in the process. The iPad and iPhone are two very difference devices; the iPad has no voice functionality for instance. We have provisioned the micro sims for these devices accordingly. The iPhone sim is provisioned for full voice, text and data services while the iPad sim is only provisioned for prepaid data services.